Further, the record reflected no statutory, regulatory, or informal authority or framework for any PTO decision on an application that is informed by the application’s SAWS status. This is because no decision or action on an application can be taken pursuant to secret annotations or designations not shared in writing with the patent applicant. 37 C.F.R. § 1.2 (“The action of the [PTO] will be based exclusively on the written record in the Office.”). According to the PTO’s own explanation, the SAWS designation, as the acronym suggests, is merely an internal “warning,” “designed as an information gathering system to apprise various areas of the PTO of the prosecution of patent applications that include sensitive subject matter.” The SAWS designation is simply designed to “help USPTO personnel in the Office of the Commissioner for Patents and the Office of Public Relations interact with the press about applications that may generate a high level of publicity.” Examination and allowance of applications are totally independent of SAWS designation, as the SAWS Report is normally prepared at the time of allowance. “The intent is to minimize any direct impact on the examination process.” In conclusion, the SAWS program had nothing to do with examination of an application on its patentability merits. Even worse, it concludes, the PTO misled the public, Congress, and the courts about the whole thing. We reported previously that inventor Gilbert Hyatt sued the PTO to challenge its decision to never award him another patent. And we noted that the PTO filed a motion to dismiss the case. 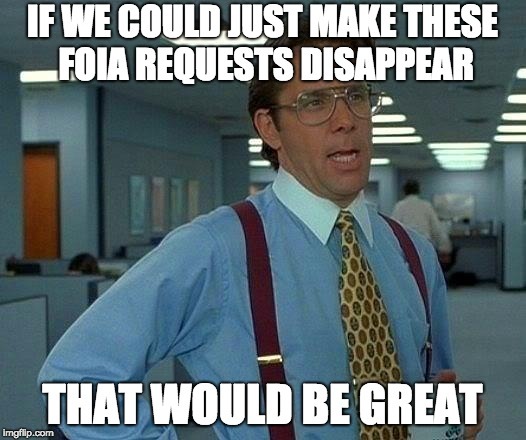 We have reported previously on inventor Gilbert Hyatt’s FOIA lawsuit to obtain an email from one patent examiner working on Mr. Hyatt’s patent applications to another concerning Mr. Hyatt, which the PTO argued was not even an “agency record” and therefore not subject to FOIA at all. Despite the vigor with which the PTO is opposing production of the Khuu email, the government has only described it as containing a “personal opinion [Ms. Khuu] expressed to a close colleague in the context of an email exchange about divorce proceedings.” [citation omitted] The PTO has failed to cite for the Court which jurisdiction, in which galaxy, would find that description enough for the government to carry its burden to establish that there is no question of material fact remaining in this matter. A federal judge has ordered the U.S. Patent and Trademark Office to issue three patents to prolific inventor Gilbert Hyatt, finding that many of his patent claims were incorrectly rejected, a win for Hyatt in his case alleging the office is wrongly stalling his patent applications. The three patents at issue in the decision represent a small fraction of the nearly 400 applications Hyatt has pending at the USPTO. He alleges in a related suit that the office is using a variety of unlawful tactics to ensure those applications are never approved. Hyatt’s attorney, Andrew Grossman of Baker & Hostetler LLP, said Tuesday that Judge Lamberth’s decision is an important development in the case that shows when Hyatt’s applications are given fair and impartial review, he will win. Mr. Hyatt’s court wins also received coverage from Bloomberg News. In a decision last week, the United States District Court for the District of Columbia rejected the PTO’s claim that independent inventor Gilbert Hyatt engaged in unreasonable and abusive delay on his patent applications. Instead, the Court found, the PTO had placed Mr. Hyatt’s applications “in a proverbial Never-Never Land,” blocking Mr. Hyatt from prosecuting them for approximately a decade. The suspensions between 2003 and 2012 appear largely to be responses to pending litigation, not the applications, themselves. To the extent PTO resents having had to devise “unusual procedures … that were not needed with respect to other applicants, who for example, did not litigate regarding procedural issue[s] and did not file Section 145 appeals,” the Court finds that sentiment to be somewhere between vexing and outright galling. It takes a certain chutzpah for a government agency to chafe against citizens seeking to vindicate their rights through lawfully available means, even in those cases where the opposing party’s litigious zeal is itself remarkable for any number of reasons. In an interview, Zinser said the policy of keeping applicants in the dark about SAWS was “just not right” and the secrecy of the program may have violated federal record-keeping requirements. Zinser said that if the board, which rules on whether an application was correctly rejected, was in fact made aware of the SAWS designation during the appeal, it would be “especially unfair.” The applicant would be unaware of the program and could not address with the board the issues that caused the patent to be singled out. How this worked in practice is illustrated in a 2012 email exchange produced by the office, in which an examiner asks a supervisor how to respond when an applicant calls to ask about the status of an application that the examiner has allowed but has been put in SAWS. “What should I tell them? That the case is under SAWS review and for [an] update they should contact [another official]?” the examiner asked. 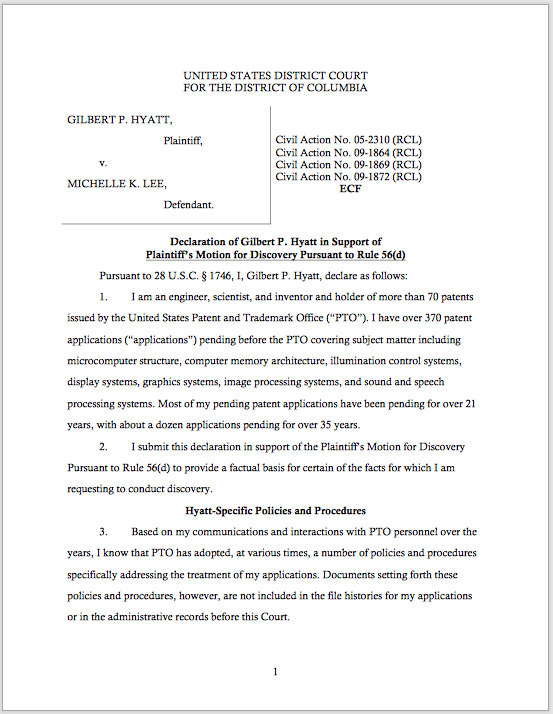 On May 16, inventor Gilbert Hyatt asked the PTO to disclose any “meme” images depicting him that were circulating among the examiners responsible for examining his patent applications. He subsequently paid the $1,056 that the PTO demanded to conduct the search and review the records. On July 18, the PTO finally responded: yes, the images exist, but, no, you can’t have them. Hyatt’s litigation to compel the PTO to disclose the email is briefed and currently awaiting decision. After the PTO asserted in court that inventor Gilbert Hyatt had purposefully delayed agency action on his own patent applications, Mr. Hyatt sought–and obtained–discovery into the PTO’s handling of his applications, its Hyatt-specific policies, its secret SAWS program, and its bias and animus against him. Unfortunately, many of those materials remain confidential, on the PTO’s say-so, and so the information they revealed is largely redacted in the public versions of Mr. Hyatt’s legal filings.